It is too often that perception and preconceived ickiness stop people from truly understanding the beauty and full capacity of an ingredient. The Beet, in my opinion, is at the forefront of this dastardly sin. There are lovers and there are haters; It is the haters who are my motivators. 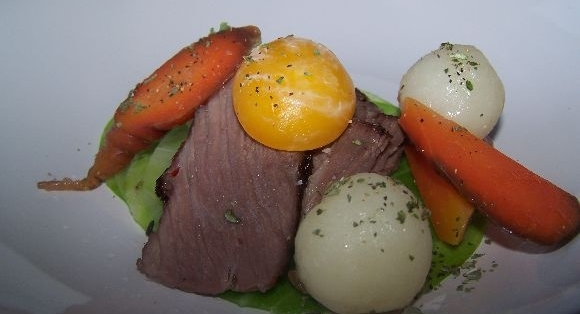 The argument, “It tastes like dirt” is a popular scapegoat catchphrase. Simple understanding (and highschool catty undertones) can clear this up, right quick; Beets grow in dirt… Perhaps you shake it off before you eat it. We will begin at the top(s). 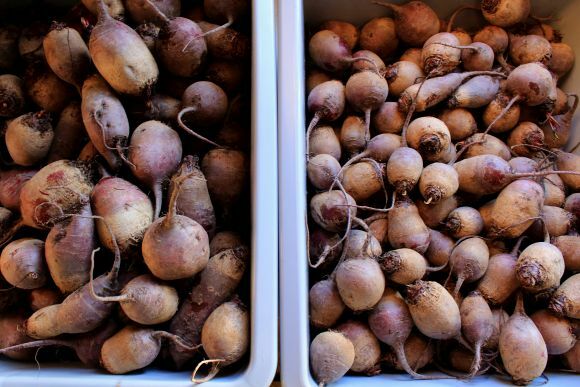 When grown, the beet is a plant that provides an edible leafy green in addition to the root. The greens or tops are likely to be more so recognized by one of their marketable nicknames such as Leaf Beets or Swiss Chard. In this blurb we will focus on the root, although I highly recommend that everyone capitalizes on the available nutrients and eats their greens. 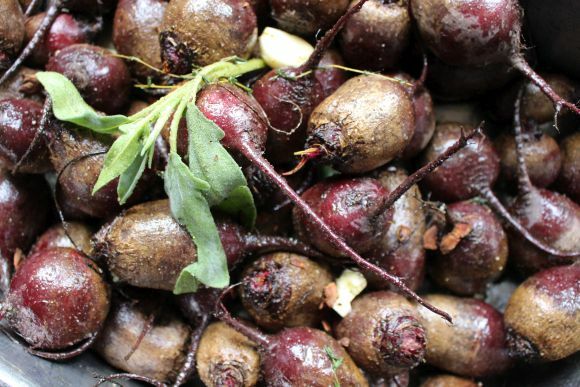 There are many varieties, colors, shapes and sizes of the beet found around the globe, none more famous than the iconic bright red root we have come to know as the Common Garden Beet, Beta vulgaris. A great vegetable to start in a garden if you fancy that life, in which case we do and have found it is a fairly simple crop to care for with a relatively high amount of nutrients. 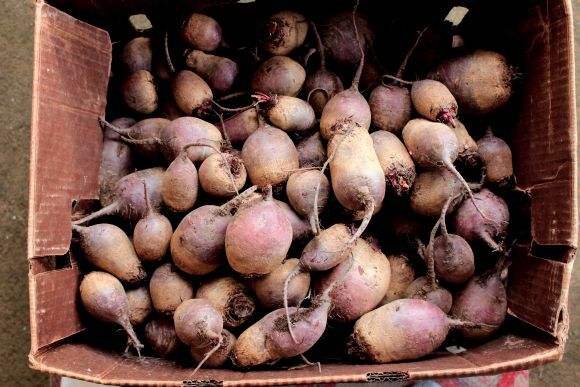 On the topic of nutrition, Beets offer a handful of vitamins ranging from Vitamins A & C to Riboflavin & Folic Acid. When planting in the garden; the most rewarding benefit may be that ability to eat the beet throughout it’s entire lifecycle. Starting from shoots to greens and working you way through the younger small roots to the roots that you harvest after first frost. Each step offers exciting nuances and the differences in appearance, color, texture, flavor, scents begin to feel as if they change daily. When shopping and selecting a “choice specimen” you want to find a beet that is firm to the touch, much like a good potato. 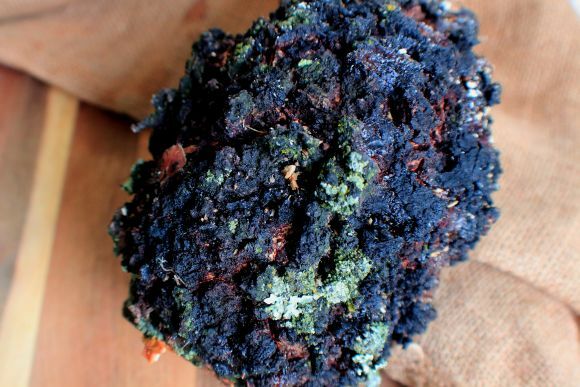 soft and mushy will give you a read on how long that beet has been above soil. You want the skin to be smooth free of wrinkles, cuts or tears. Remember that the larger the beet, the more “woody” and dense that root will be. 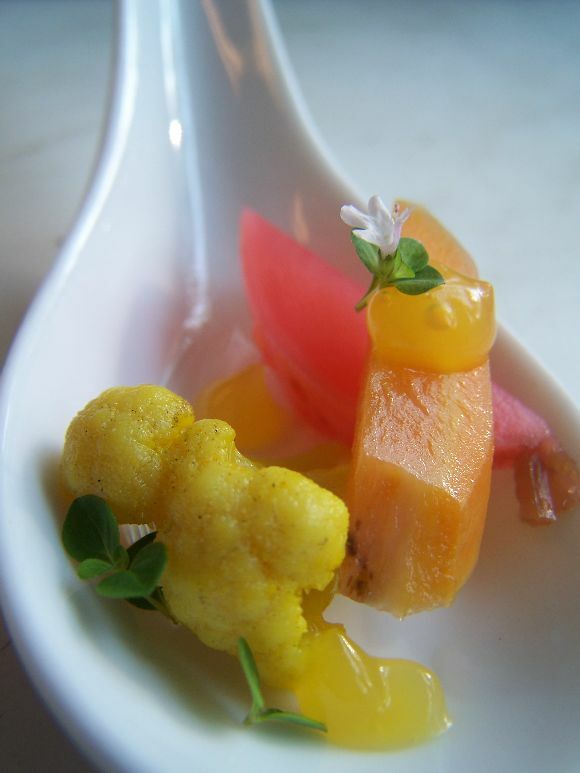 It is the young, golf ball sized beet that you want for an optimal dining experience. You want a root that has about an inch of stem still intact; if not the greens themselves. If the greens are intact, you want them to look lively, crips & healthy. Shy away from wilted, droopy, bruised tops. The greens leech moisture from the root. To combat this natural epidemic, it has been noted that trimming the greens (rather cutting into the flesh of the root) will greatly decrease the loss of moisture to ensure that you are keeping the “waters” of the beet in the root and you are eating a desirable, succulent, easily digestible bundle of simple carbohydrates. This particular variety is a Red Ace; prized for it’s color, shape and consistency amongst farmers. A: With a 50 lb box of beets. Located in Fall Creek (just South of Eau Claire), perched atop a hill, Jake and Briana have a quality in their produce that is a direct reflection of their Smiles… Beautifully inspiring! A pair of the happiest farmers I’ve met in years, a genuine excitement in what they are doing that shows throughout there practice. Step 1: Put on a pair of gloves and peel the portion of big beets. 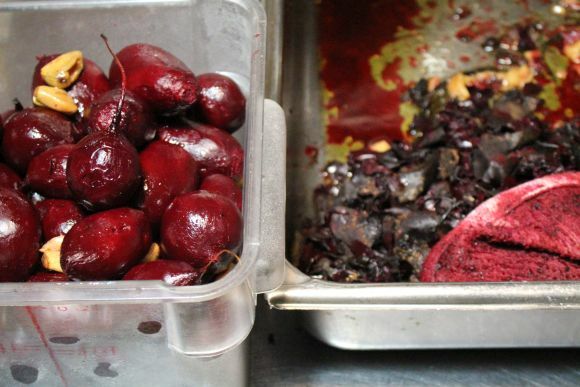 *I do not choose to wear gloves for any job in a kitchen; Except Beets. You’ll thank me when your hands are clean at the end instead of blood red for a month. Step 2: Grate the raw beets! A food processor typically comes with a grater attachment and is a great tool for this. Or an old fashioned box grater works too… if you feel like punishing yourself. 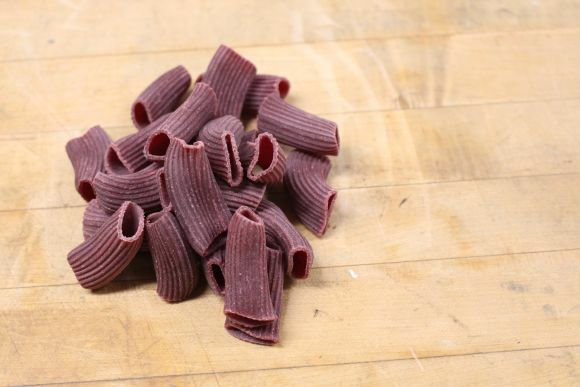 You want to finish with something that resembles red hashbrowns. 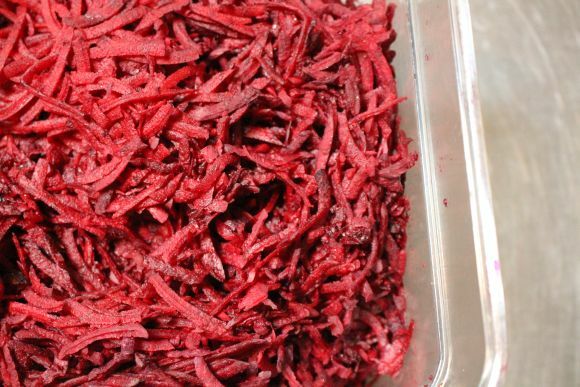 Step 3: Lay out the shredded beet on dehydrator trays evenly dispersed in thin layers. I dried the beet for approximately 14 hours at 125°F. This took a bit longer than usual just due to the amount of beets I had loaded up in the dehydrator. You want them to come out crisp to the touch, when you pinch a piece you want it to disinterate in your hand; extra crunchy! Step 4: When dried (thoroughly) Begin grinding your shreds into a powder using any number of methods… Mortal & Pestle & Food processors will get you a chunky powder-ish product; but for the real fine grind you want to get your hands on an espresso grinder. Coffee grinders are good too, but always take a couple runs before breaking the substance down into a real fine consistency. 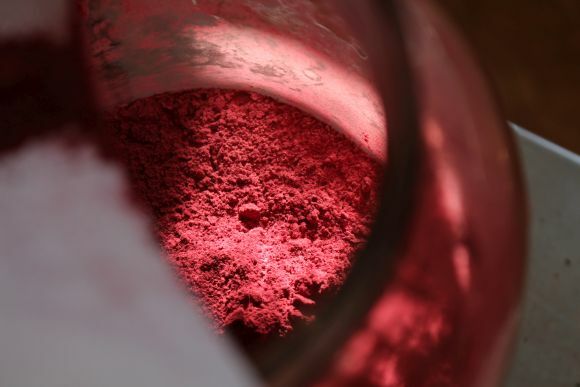 Step 5: After, grinding the beet root particles primarily, sift the powder removing any large pieces and grind those large pieces again. Jar and store. to be considered “shelf stable” you are looking for a water activity level ( a measurement monitoring the vapor pressure of an ingredient to identify the level of moisture) in a food of about .85 or lower. I’ve Clocked this guy at a .543; its going to keep for a while. 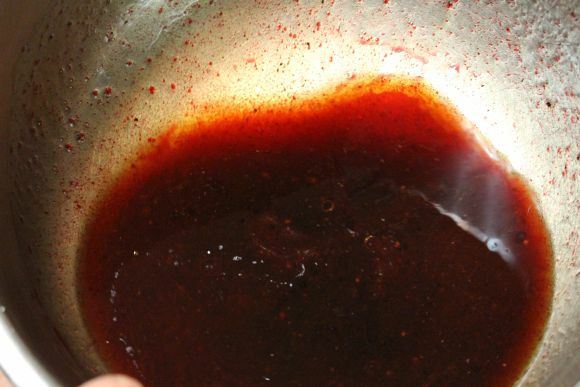 Do take note that the older a powder; the greater the loss of pigment often changing from a vibrant red to a brick red, an eventually a brown. Something to keep in mind when sourcing powder from your distributor. 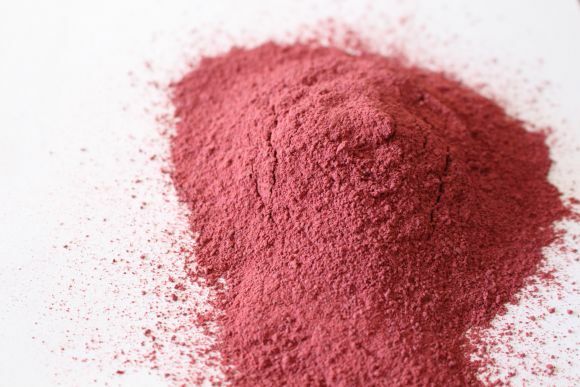 Why would I make my own beet powder? Can’t you just buy that? You know where your beets are grown… Quality Control. I started with 20 lbs of shredded beet, I ended with 6 lbs of beet powder. Through a distributor I used back in the day; I paid 21.12 a pound. The 6 pounds out of 1/3rd of the box, easily paid for the remainder of the box with a large profit… Food cost, down. 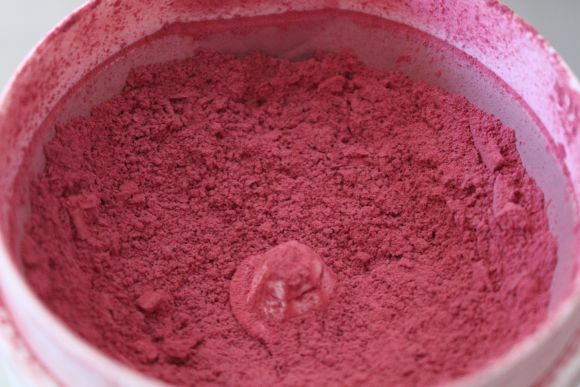 From Beet Powder… you can go as far as you imagination will take you. 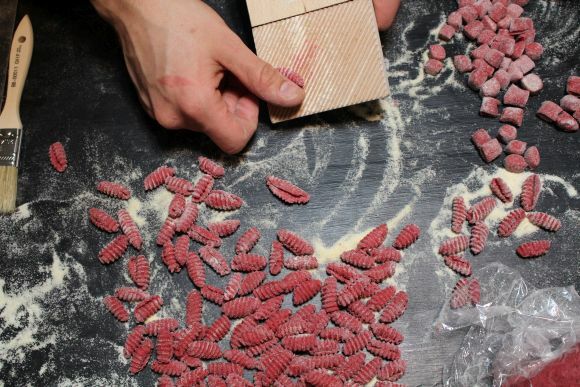 Or making an unbelievably Beetiful Rigatoni. These were prepared & preserved in another way. PICKLES. 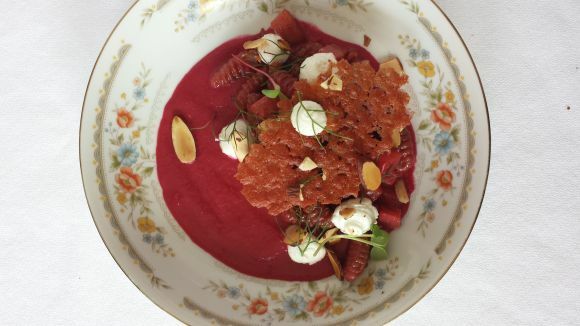 This is the easiest way to fall in love with beets! Eating them hot. 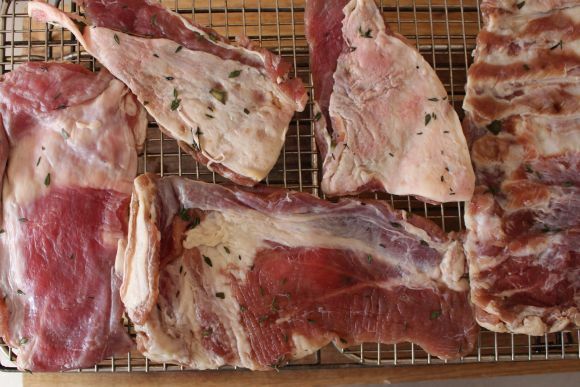 Roasted in garlic, herbs, anise, salt & pepper. Mmm. 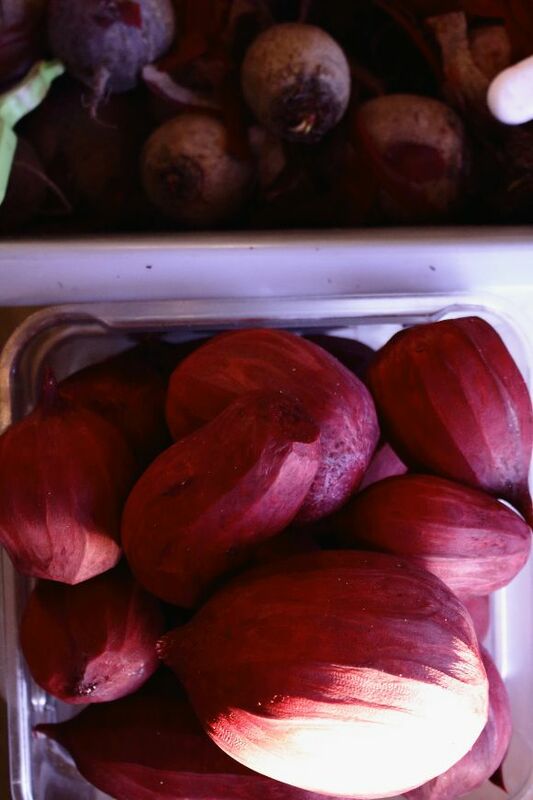 This is the first step in making our pickle beets. Many people boil; but… I just can’t. I don’t know if it is the loss of color, or if it’s the idea of skipping over the step where I clean the roasted ruby and eat it. Also, it adds depth to your Pickles. 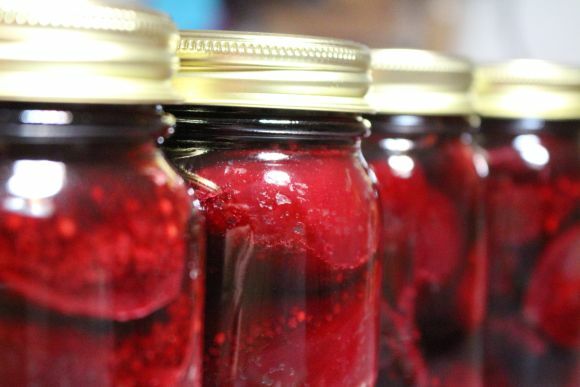 Pack a Pint Jar full of the clean beets and continue by applying your favorite recipe. I process in a hot water bath for 12 minutes. They keep Forever… or a really long time. I was going to provide a exuberant testimonial but as I thought about the oldest can of beets I’ve ever eaten… Well, Let’s just say, the four jars pictured above are no longer with us. I eat beets enough that I hope people call me maroon tooth (loose reference to bluetooth; google it). We can’t get enough. This is a collection of roasted beet juice, & olive oil taken from the bottom of the roasting pan. 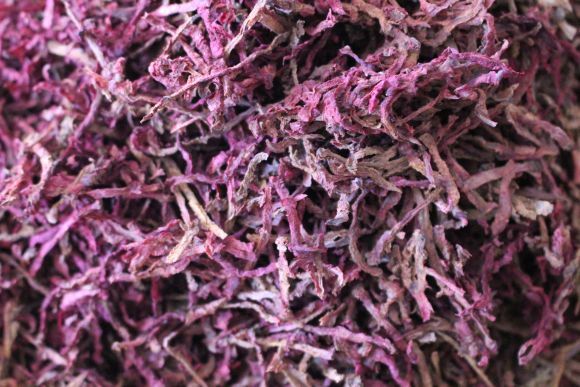 Roasted Beet Vin. it’s a real thing and if you haven’t tried it… You’re Welcome. Sometimes; when you feel that beet in your heart, you just roll with it. As you can see, this isn’t going to stop. This is only the beginning of a little thing I like to call, Operation Beet Puns Until Everyone Tries Them And Falls In Love. (or O.B.P.U.E.T.T.A.F.I.L.). This is just a string of random thoughts from which will one day spawn a collection of beet-centric blurbs.